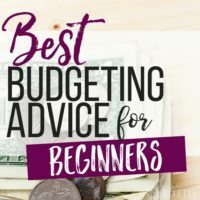 Everyone who has ever started a budget has ended up asking themselves “What do I do when I go over my budget?” There’s a reason for that. Every single person that has created a budget has also went over their budget. Every. Single. Person. That’s one of the biggest problems you’ll encounter when you start getting a handle on your financial life. 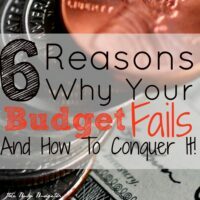 When you set up your budget, and “fail” to stick with it the first month, you’ll feel like the budget isn’t working and want to abandon it. Don’t. This is a very normal part of budgeting. This is a new skill that you’re learning. As with any skill, it gets better with practice. How do I prevent going over my budget? 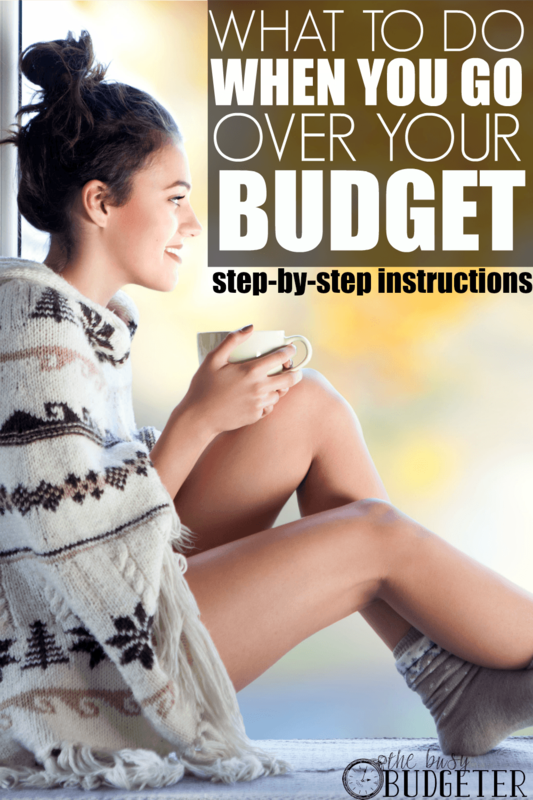 Let me cover how to make it easier to stay within your budget, because that’s the ultimate goal. In order to stick to your budget, you’re going to need both a plan (which is your actual budget) and willpower. I can walk you step by step through how to “trick yourself” into having will power by planning ahead in this post. 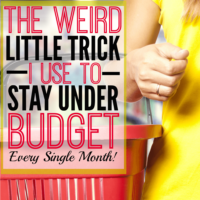 The best tip I have to help you stay under budget is pretty weird, but it works every time. You can read about that here, but I warn you that it’s hard to wrap your mind around. See if another budget category has extra that you can take it from. If you have discretionary funds like entertainment or eating out, that should be the first place to look. Tell yourself that credit cards are not an option. They just aren’t. This is how you got into debt in the first place. I would rather you not pay a bill, then to use your credit card. At some point, you need to feel the effects of not being able to pay your bills. Once that happens, your situation will change quickly. I don’t believe that credit cards are evil, plenty of people use them wisely and make them work for them. That’s not us. You wouldn’t be reading this article if that was the case. Under no circumstances are you going to use that credit card. Call your bill providers and tell them you’re behind. Our goal is to make up the amount of extra spending we have in our budget. While we do this though, we want to keep our bill providers in the loop if we're going to be late. You can read more here about what to do when you can't pay your bills, but call your bill provider and let them know that you’re taking this matter seriously and are doing everything possible to make sure that your bill will be paid at the end of the month. Ask if there is anything they can do to help you such as waive late fees or push back a due date. Reduce your grocery spending as much as possible. Your grocery bill has the most potential for “finding” a large amount of money, but it’s also the most difficult to reduce if you struggle with a hectic schedule or weak willpower. Your best bet is to find super cheap, very easy, recipes that you like to eat for the rest of the month. I'll warn you that these likely won’t be the most nutritious meals. Think Santa Fe Rice and Beans, $5 Dinners' Mac and Cheese (Actually $5 Dinners' anything! ), and the good old peanut butter and jelly sandwich. Return your extra purchases if you can. I know you don’t want to do this. You bought it because you really wanted it. If it’s possible though, see if you can return those purchases so you don’t even have to worry about this. Gather up everything you don’t use or need in your house and sell it on EBay for a 7-day sale. (Lots of similar sized clothing does particularly well here. Example: Size 12 jeans- lot of 6 – Gap, American Eagle). User Testing pays $10 for a 15-minute test and pays you via PayPal 7 days after your test. You need to qualify for the tests but I make about $100/month doing this without really trying. I just leave the website running in the background when I don’t have anything else going on so I can hear the ping of a new test available. You can find out more about User Testing here. Feel the effects of your mistake and make tough choices. You’re training yourself just as you would train a child. Your goal is to feel the consequences of your actions so that you choose a difference path next time. When you go over budget, you want to just brush it off like it’s no big deal and move on. If you’re in a tough financial spot though, that’s the worst thing you can do. If you just stick it on a credit card and continue life as normal, you will never break this cycle. And you are so much better than that. I want you to make tough choices. Cancel your internet for next month, cancel your cable, get rid of data and texting on your phone (GASP! Yep- totally went there). Say no to everything that you don’t NEED. If you do that, then I promise you that you will stop exceeding your budget. It’s not the popular answer… but it’s the truthful one. Ultimately, depending on how close your budget is, your answer of what to do when you go over your budget may be really simple. If you have a lot of discretionary funds, then you just Move some money over and move on. If your budget is incredibly tight and you’re fighting serious willpower issues, this could be a really tough phase for you. I get that. Stay the course. It gets better. 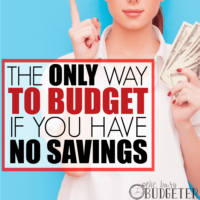 Once you start making those tough choices, Sticking to your budget gets so much easier. How do you handle going over your budget? Do you go over your budget often? A few times a year, I go haywire and off the budget and start charging on the credit card. I need a recharge to get me back on the right track. Normally, this is when I start browsing for new budget blogs to refresh my memory and start the motivation process again. Your blog is just that– it touches on general mistakes, but also provides the continued push to stay on track. It speaks to me at my level. I’m glad I found it! This is spot on!! I love that credit cards are NOT an option, and we have to feel the pain of our mistakes. AND THEREBY LEARN FROM THEM. I think that’s what credit cards do, is make it so easy to cover up our stupidity, and create even more of it so painlessly… sigh. Th best lessons in life tend to painful. But man, you learn them once and they stick with you for life! I agree, using credit cards to make up for gaps in the budget is not a good idea. However, in step #2 where its says not to pay the bill if it means using your credit card. What if the bill is a cell phone or utility bill and the missed payment shows up on your credit report, isn’t that worse? Is there not another way? Ok I am a person who started a budget with the pay I make now I had a few hard turns or shall i say knocks, but I was doing well until I went back to a banking and debit card usage then I screwed up some where down the line. So I almost stop keep all track until I decided to start again right where I am budgeting is not easy once getting thrown off track again but now I know to pick up and keep going. It happens, ok. Here I go again.